In a few months the waterways of northern Saskatchewan would be ice free and York boat brigades would again travel to supply the Hudson's Bay Company posts of the Athabasca and Mackenzie River Districts located north of the Methye Portage. It was spring and some swift moving rivers like the Beaver River were relatively free of ice. Open water was beginning to show along some lakes. 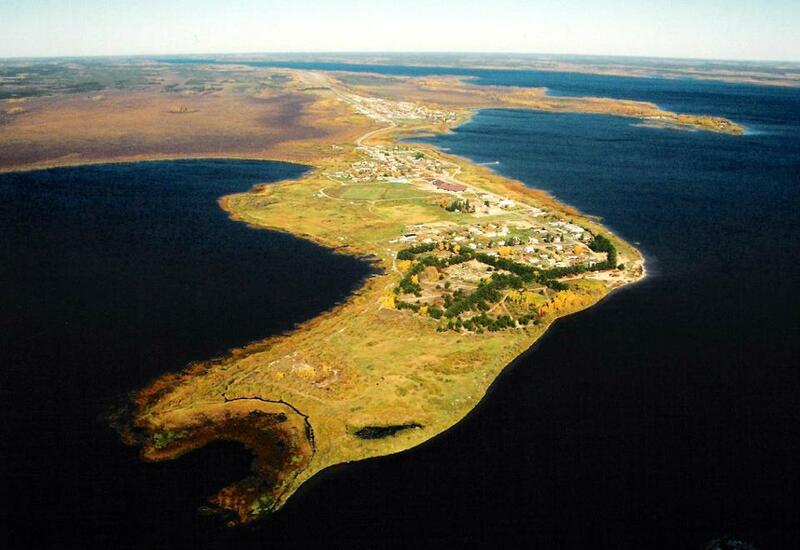 In the last week of April 1885 rumours of war reached the isolated village of Ile a la Crosse. The village had a population of about 300 people. Most were descendants of French Metis from Red River. Ile a la Crosse was the birthplace of Louis Riel Sr. the father of Louis Riel in 1817. Sara Riel the sister of Louis Riel died in Ile a la Crosse in 1883. She was 34 years old. Roderick Ross the Chief Factor of Île-à-la-Crosse alarmed by the persistent rumours of war and suspicious of the arrogant attitude of a few of the local Métis sent one of his clerks for information. On April 27 the clerk returned with the alarming news that Cree rebels were advancing and had already looted the Green Lake Post after having chased away the loyal Métis. The fearful M. Ross unable to judge the situation called his clerks and Father Rapet of the Mission together and all agreed to leave immediately. Father Rapet announced this decision to his people who felt that the decision was premature. But the Grey Nuns were terrified that Riel who had accused them of letting his younger sister Sister Marguerite-Marie (Sara Riel) die of misery would seek revenge. They decided to leave. The animals of the mission were sent to Canoe Lake. Precious objects were hidden away. Necessary items were packed in haste. The Holy Eucharist was taken. So, like the monks of the Middle Ages harassed by barbarian hordes, they carried their treasures, statues, relics to far away places so they could be at peace while Brother Némoz stayed alone guarding the mission. That first night the large group reached the large sand point where they set up camp. They were cold and wet after crossing the lake however the prudent M. Ross ordered that no fire be lit. Not one of the shivering group stopped an old French Canadian in the group who carried log by log an enormous quantity of wood and lit a great fire. 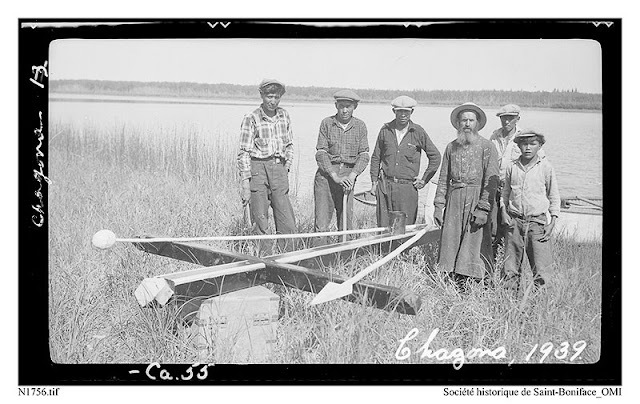 The next day on April 28 the voyageurs arrived at the English River (near Patuanak) and established a permanent camp. Brother Labelle, Brother Marcilly and a few employees of the Hudson's Bay Company left to take care of the cattle. Several of these employees found themselves on the small sand point when they heard the rifle fire from the Beaver River the joyous salvos saluting the birth of the Sinclair baby. To the Métis of Île-à-la-Crosse it was a sinister sign of things to come. It was without doubt the last echo of the execution of Father Paquette and his Métis companions who were expected to arrive from Green Lake. Quickly they thought they must bring the news to M. Ross. The night of this second move Father Paquette having walked all day over the ice arrived at the fort tired and irritable. The clerk Franklin in pity fed him and dressed him in his own clothes. The missionary stunned to find no one in these large buildings was told of the cause of the exodus of the population. The mission was also deserted. Brother Némoz was there and Brother Marcilly coming with the cattle was ready to leave but decided to wait till the next day and bring Father Paquette if he wanted. During his slumber Paquette's feelings of peace and security he felt earlier disappeared replaced by a sudden panic. He told himself "If everyone believes there is danger who am I to pretend there is none". Sitting up suddenly he sees a red glow on the horizon like the reflection of a huge fire. There is no doubt the enemy is coming. Quickly he wakes his companions and tells Brother Marcilly to harness the dogs while he throws bags out of the window. The young men and Brothers in fear run to see what the fuss is all about and Father Paquette points to the sky where the fire was only to see the moon in a red glow. Everyone laughs and return to bed. When he had arrived at the Fort Father Paquette had suggested a meeting of all the Metis and Indians of the area and this was done. So the next day on the afternoon of April 30 about 60 men had gathered: Metis, Dene and Cree from Canoe Lake. As Paquette entered the hall he found them arguing with the clerk. Since it was in the interest of the Company that they had to leave their homes and occupations they asked to be fed by the Company during these troubled times. One Metis pretended to have received permission from M. Clarke and Ross to take whatever they needed from the store. MM. Franklin and Sinclair said it was not true. Father Paquette asked who had authorized it. Angus Mckay he said and Paquette called him a liar. So one Metis said menacingly: "Who would stop us from taking supplies by force since you have refused us?" Eventually the clerk promised to distribute supplies and ammunition to the men so they could feed their families and everyone calmed down. So on May 2 three York boats manned by 50 armed men left for Green Lake. Midway they met a couple of Indians who warned them of the danger they might expect on the way. (The rumours were: The warriors of Big Bear were in the vicinity A group of volunteers from Prince Albert had gone to Green Lake and met these warriors and were sent back on foot their horses stolen.) The Metis turned around in fear and returned to Ile a la Crosse announcing that the warriors of Big Bear in all probability would attack the Fort that night. In face of this new danger Father Paquette decided to leave with his two companions to the island of refuge. M. Ross who was always anxious seeing three strangers coming to the camp ordered one of the guards to fire on them but a Metis never fires without seeing and soon recognized Paquette who had long been awaited. The story of Paquette and his news reawakened the fears of the refugees. M. Ross fearing that the Indians and the Metis of Ile a la Crosse would help the warriors of Big Bear begged Father Rapet and Father Dauphin to go preach peace and loyalty to the Queen to them. The two missionaries found the Fort in perfect calm and the two clerks on best terms with the people. They had but to give a little wise advice. Father Dauphin thinking that his presence would be helpful at the mission refused to return to the island of refuge. Mass was begun in the parish church and the exercises of May the month of Mary were done every night. Persuaded that there was no longer any danger he advised the defenders of Ile a la Crosse to return to their homes and occupations. Father Moraud and Dene men from Patuanak replacing the cross on Cross Island north of Patuanak (or Chagona) in 1939. Chagona appears to be another spelling of Shagwenaw the lake on which Patuanak was built. 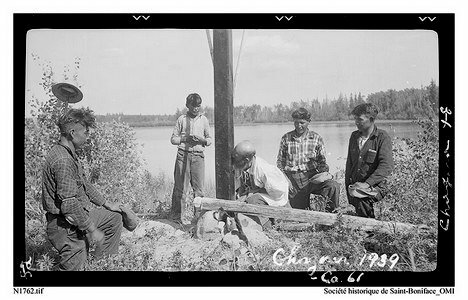 Father Moraud and Dene men from Patuanak replacing the cross on Cross Island in 1939.